Decorating or redecorating your home can incite different feelings for each of us. For some, it is an absolute pleasure and you relish the challenge of transforming a room. For others, few things seem quite as daunting with the endless number of options and decisions there are to make. Either way, being inventive with your homeware and interior design, although quite a process, can be seriously rewarding when you pull off a fabulous end result. The decorating process most certainly should not be taken lightly, after all it is you that will be living with your choices! Being clear about what you do and don’t like will make the whole process of redecorating your home a whole lot easier. However it pays to have an open mind, especially when opting for something that you haven’t tried before. Simple changes such as updating sheets or bedding is a good place to start if you’d rather not leap into dramatic changes you’re unsure about. It is however, simpler than you might first expect to bring refreshing and creative colour into your home. By selecting hues that not only make you smile but also enhance the mood and decor of the rest of your house, you can design a space that is peaceful and composed, yet still packs a punch. Earthy tones are always a great place to start when looking at redecorating your home, especially a room. Further colour accents can then be added later to give the room the right amount of jazz. If you’re starting from scratch, begin by establishing a colour palette for your room, and add accessories and artwork that further enhance the feel of the room. Sage green is a beautiful option for a colour that’s neutral enough for house wide use. Sage greens are muted greens with grayish undertones. It enhances other hues (especially wood grains) while also being savoury enough to use on its own. The quiet silver-green of sage brings about a feeling of serenity and calmness. Either warm or cool, they are always soft and give a very different effect from other greens that might spring to mind. Crisp apple green gives off a major pop of colour, whereas dark olive greens appear more dramatic and theatrical. Sage green however is a safe and elegant colour choice that will blend in well with other earthy and natural colours spread out throughout your home. If you’re looking to make just a subtle change in décor, why not opt for a beautiful new duvet cover. Something as simple as changing up your linen can give a room a whole new feel. A simple change is also a great way to decipher whether you’d eventually like to introduce more of that colour, more of that style or whether you’re quite okay with just a small but effective change. Sage green linen is not only modern and on trend, but it also works in period or styled homes so as to keep your decorating options open. Whether your home is colonial, Tuscan, or contemporary, lift your interior by introducing an element of sage. The Hampton Linen Duvet Cover Set is a fabulous option as an elegant update to your home. The subdued green brings about feelings of serenity and calm, perfect for the bedroom. The soft duvet set can also be used as a throw at the end of the bed, or partnered with patterned pillows and quilts to create further interest and textures. Opting for a new touch of colour can be a great way to refresh and energise your living spaces. Subtle changes can still speak volumes when carefully and thoughtfully selected. The bedroom is a great place to begin when introducing new colour, a uniquely personal space that should be a reflection of what really appeals. Once you’ve mastered your sheets and your bedding, you can look at introducing other homeware elements that make your room pop. Updating your interior should be a fun, yet thought out and enjoyable process. Inject your home with colour that you’ll love! 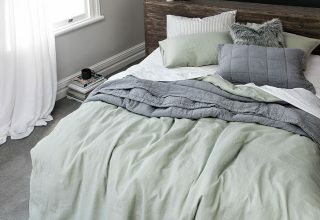 Shop the Hampton Linen Duvet Cover Set in sage.